KnightNews.com has obtained former UCF Knights star Quarterback Kyle Israel’s arrest affidavit, filled out by UCF police officer Christopher Holt. The affidavit suggests UCF police are now hanging out off campus, pulling people over they suspect are driving under the influence. Before Israel was arrested, the officer wrote, he was “clearing a traffic stop on University Blvd. and Turbine Dr.,” which is the entrance to the plaza where Knight Library and Fubar are located. UCF police Ofc. Holt first noticed Israel’s SUV, he wrote, because his headlights were off while he was driving down University Blvd. toward Alafaya Trail. Holt then followed Israel to that intersection, and wrote that Israel was driving erratically while approaching the intersection and then while turning left onto Alafaya Trail, so he pulled him over at Centaurus Drive and Alafaya Trail. Holt’s affidavit suggests Israel put his windshield wiper on by mistake, thinking it was his headlights, because he was allegedly intoxicated. Holt wrote that Israel told him he had been drinking at TD’s Sports Bar earlier in the night, and even possibly filled in as a bartender for a friend. However, Holt said Israel also initially told him he was coming from Science Drive, even though Science Drive didn’t intersect with University Blvd., where Holt first noticed him. “Most of what Mr. Israel was saying seemed to not make any sense,” Holt wrote. Holt had Israel perform several field sobriety tests after smelling alcohol on his breath and noticing his eyes were “extremely red and glassy.” Based on the tests, Holt brought Israel to the Orange County DUI Testing Center. Israel initially refused to submit to the breathalyser test, but was apparently persuaded to do so by Holt, after “explaining the consequences for (Israel’s) different options multiple times,” according to the affidavit. The affidavit states Israel blew twice. The first reading at 4:48 a.m. came in at .165, and the next reading, at 4:52 a.m., came in at .177. The legal limit in Florida is .08. Israel was arrested and booked into the Orange County Jail shortly thereafter. Records show he bonded out shortly before noon. KnightNews.com sent Israel a Facebook message seeking his side of the story, but he has not replied. UCF Police spokesman Cpl. James Roop also has, so far, declined to comment on this high-profile arrest. Click here to read the entire five page affidavit yourself. KnightNews.com wants to know: Have you, or anyone you know, been pulled over by UCF police off campus lately? Are UCF police employing the same aggressive DUI enforcement tactics off campus that they have been reported to use on campus, such as “courtesy stops” around the same times the bars close? E-mail us at news@knightnews.com to share your story, or call our tip line at 407-5-tip-UCF to let us know. 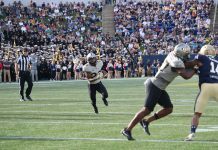 UCF police arrested former Knights star quarterback, Kyle Israel, Tuesday on driving under the influence charges in the university area, according to the Orlando Sentinel. 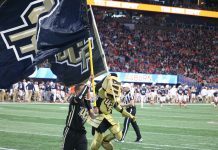 Israel, who attended University High School before playing for UCF, led the Knights to a Conference USA Championship in 2007. He played professional football earlier this year in Germany, and came back to Orlando and worked as a commentator for Bright House Sports Network. We are gathering more information on this developing story and are attempting to contact Israel for his side of the story. UCF Police Spokesman Cpl. Jim Roop did not immediately return an e-mail seeking comment. Check back for updates. Click next page to see the police report filled out by UCF police officer Christopher Holt.